Football is one of the remaining spheres in which it is acceptable to openly display patriotic sentiment. This seems to apply in every country. The relationship between football and nationhood was shaped by particular historical and cultural factors. 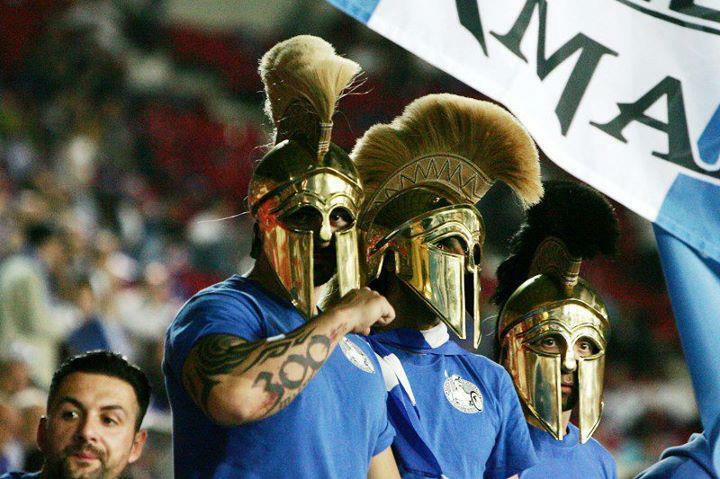 There might be different perceptions among people of how direct this association is, but those with far-right political affiliations apparently find it it easier to project symbolic meanings of Greek pride on a team of players that represents the nation in a game. Georgios Papadopoulos, one of the military dictatorship's architects back in the 70's, encouraged people to watch football whilst he imposed severe constraints in civil liberties. That says a lot about how to channel outrage on a safe outlet. In view of the historical coincidence between eurozone crisis and the advent of Euro 2012 football championship, media evoked national pride for Friday's quarter-final, fueling Greeks' sentiment as they were admittedly looking forward to watching the game on telly. Even journalist Vivi Draka dared to appear on State TV with a face paint of the Greek flag. A soccer game suddenly came to have political connotations, with the punishing anti-austerity message having its moment again, spreading from election results to the football grass field. Despite Greek team's defeat, national pride remained intact as efforts were largely appreciated by the public. Maybe the real winners were those lucky few immigrants that were not bashed by violent xenophobic nationalists as a demonstration of strength and dominance.